They may look cute and fuzzy; but a groundhog can lay waste to your backyard garden plot in a single night. All the hours you spent digging and planting and the money spent on seeds and plants can be destroyed in a matter of hours by a hungry groundhog. 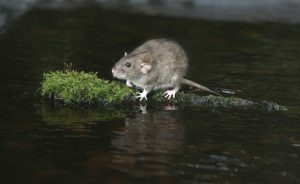 These herbivorous rodents have a taste for leafy green vegetation but won’t think twice about feasting on your expensive landscape plants and ornamental grasses. They can also cause serious damage to lawns when they use their sharp talons to dig for grubs and snails. Native to New Jersey and common throughout Eastern and Midwestern states, groundhogs, called woodchucks in some areas, are members of the marmot family. Adults are brown with short bushy tails, weigh between 4 and 9 pounds and grow to an average length of 16 to 26 inches. These rodents typically live in underground dens in forested areas but in suburban areas will burrow under porches, decks and sheds. Dens harbor fleas, ticks and mites which can migrate indoors or onto pets when dens are built under homes. Fierce defenders, groundhogs can carry rabies, presenting a serious problem for New York City, Long Island and New Jersey homeowners, particularly in late spring when litters are born. For your safety, humane groundhog removal should be performed by an experienced New Jersey wildlife removal expert. The groundhog is best known throughout the United States for its ability to predict the early arrival of spring which is determined when he emerges from his lair in Western Pennsylvania in early February. The fun tradition of having Punxsutawney Phil predict spring may have many people believing that the large rodent is all fun and games, but having a groundhog living in your yard means you will endure significant damage to your landscaping. Groundhogs are from the marmot family. They are considered to be docile rodents that do not attack humans and are considered to be disease free. Groundhogs however do have a huge appetite for vegetation, especially grasses, clover and alfalfa. New York and New Jersey homeowners often become frustrated with groundhogs as these rodents can easily consume an entire vegetable garden overnight as well. Groundhogs are also known as “woodchucks” or “whistle pigs”. Groundhogs have long curved claws which enable them to dig their burrows beneath the soil. Groundhogs feed in the morning and evening hours. At times people will see them basking in the sun during the afternoon hours. Groundhogs are one of the few mammals that go into true hibernation which is why they consume an extreme amount of vegetation in the late summer and early fall. New York and New Jersey homeowners should never try to poison groundhogs as they will consume the poison and move on to another area. The poisoned bodies can then be consumed by pets or other wildlife which will also become poisoned and will die. A licensed NY and NJ pest control professional like Stern Environmental Group will be able to humanely trap groundhogs quickly and efficiently. We offer 24 emergency groundhog removal services so that your property will be protected from these voracious eaters. Call us today!